Hypoglycemia is the most commonly observed adverse reaction in patients using insulin, including LANTUS [See Warnings and Precautions (5.3)]. Tables 5 and 6 summarize the incidence of severe hypoglycemia in the LANTUS individual clinical trials. Severe symptomatic hypoglycemia was defined as an event with symptoms consistent with hypoglycemia requiring the assistance of another person and associated with either a blood glucose below 50 mg/dL (â‰¤56 mg/dL in the 5-year trial) or prompt recovery after oral carbohydrate, intravenous glucose or glucagon administration. In controlled clinical studies comparing LANTUS to NPH insulin, 593 of 3890 patients (15%) with type 1 and type 2 diabetes were â‰¥65 years of age and 80 (2%) patients were â‰¥75 years of age. The only difference in safety or effectiveness in the subpopulation of patients â‰¥65 years of age compared to the entire study population was a higher incidence of cardiovascular events typically seen in an older population in both LANTUS and NPH insulin-treated patients. The safety and effectiveness of LANTUS given once-daily at bedtime was compared to that of once-daily and twice-daily NPH insulin in open-label, randomized, active-controlled, parallel studies of 2,327 adult patients and 349 pediatric patients with type 1 diabetes mellitus and 1,563 adult patients with type 2 diabetes mellitus (see Tables 8â€“11). In general, the reduction in glycated hemoglobin (HbA1c) with LANTUS was similar to that with NPH insulin. The overall rates of hypoglycemia did not differ between patients with diabetes treated with LANTUS compared to NPH insulin [See Adverse Reactions (6.1)]. Type 1 Diabetesâ€“Adult (see Table 8). Type 1 Diabetesâ€“Pediatric (see Table 9). Type 2 Diabetesâ€“Adult (see Table 10). In a randomized, controlled clinical study (Study G), patients with type 2 diabetes were randomized to 5 years of treatment with once-daily LANTUS or twice-daily NPH insulin. For patients not previously treated with insulin, the starting dose of LANTUS or NPH insulin was 10 units daily. 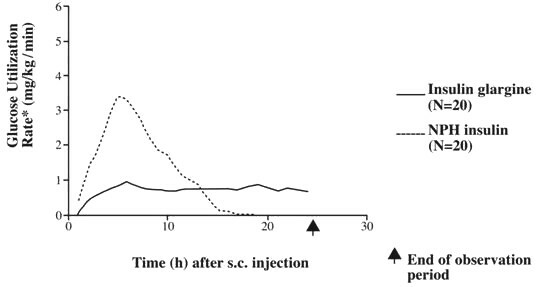 Patients who were already treated with NPH insulin either continued on the same total daily NPH insulin dose or started LANTUS at a dose that was 80% of the total previous NPH insulin dose. The primary endpoint for this study was a comparison of the progression of diabetic retinopathy by 3 or more steps on the Early Treatment Diabetic Retinopathy Study (ETDRS) scale. HbA1c change from baseline was a secondary endpoint. Similar glycemic control in the 2 treatment groups was desired in order to not confound the interpretation of the retinal data. Patients or study personnel used an algorithm to adjust the LANTUS and NPH insulin doses to a target fasting plasma glucose â‰¤100 mg/dL. After the LANTUS or NPH insulin dose was adjusted, other anti-diabetic agents, including pre-meal insulin were to be adjusted or added. The LANTUS group had a smaller mean reduction from baseline in HbA1c compared to the NPH insulin group, which may be explained by the lower daily basal insulin doses in the LANTUS group (Table 10). Both treatment groups had a similar incidence of reported symptomatic hypoglycemia. The incidences of severe symptomatic hypoglycemia are given in Table 6 [See Adverse Reactions (6.1)]. • In Study G, the baseline dose of basal or total insulin was the first available on-treatment dose prescribed during the study (on visit month 1.5). BD Ultra-Fineâ„¢ needles1 to be used in conjunction with SoloStar and OptiClik are sold separately and are manufactured by BD. Unopened LANTUS vials, cartridge systems and SoloStar device should be stored in a refrigerator, 36°F â€“ 46°F (2°C â€“ 8°C). Discard after the expiration date. • use after the expiration date. Always attach a new needle before use. BD Ultra-Fineâ„¢ needlesâ€ are compatible with OptiClik. These are sold separately and are manufactured by BD. • The Cartridge System is undamaged. • The Start Button, Dosage Knob, and Digital Dose Display operate properly. • Make sure the Dosage Knob is pushed in. • Hold the Pen Body with the release button facing up. Insert the Cartridge System straight into the Pen Body. If you meet resistance, slightly raise and rotate the Cartridge System while inserting it. Make sure that it clicks in. Do not use force. • To make sure that the Cartridge System clicked in place properly, gently try pulling out the Cartridge System. The Cartridge System should not come out. Make sure you do not press the Cartridge Release button during or after this check. • Peel off the Protective Seal on the needle. • Remove Outer Needle Cap from the needle. • The Dosage Knob must come out. "00" appears in the Digital Dose Display. • Turn the Dosage Knob to the right (clockwise) until it clicks. "01" appears in the Digital Dose Display. • Remove and discard the Inner Needle Cap. Handle the exposed needle carefully. • Hold OptiClik ® with the needle pointing up. • Turn the Dosage Knob slowly to the right (clockwise) until you reach your required dose. Make sure that the dosage knob is not in between two dose steps. You must feel and hear a click. If you have selected a dose that is too high, simply turn the Dosage Knob back (to the left). If you have dialed past 80 units, see (B.) TROUBLESHOOTING, Dose-setting on the back of this leaflet. • Check the label on your cartridge system to make sure you have the correct insulin before injecting. Clean the injection area with alcohol. Insert the needle as recommended by your healthcare professional (e.g., lightly pinch a fold of skin on your upper arm, stomach, or thigh. Insert the needle straight into the pinched skin). • Press the Dosage Knob slowly and completely. Slowly count to 10 while holding the Dosage Knob in before withdrawing the needle.The Dosage Knob must stay in. The Dosage Knob staying in after injection indicates the delivery of the full dose. • Replace Outer Needle Cap carefully. • Remove the needle after the injection. For safe disposal of needles see (A.) GENERAL NOTES, Needles for OptiClik ® on the back of this leaflet. Always replace Pen Cap on the Pen Body after use. • Press the Cartridge Release Button, and remove the entire Cartridge System. Dispose of the Cartridge System. • You are turning to the left and trying to dial down below zero. Turn the Dosage Knob to the right to dial your dose. • Do not force the Dosage Knob any further (to the right). Inject the partial dose (20 units in the example), and replace the empty Cartridge System with a new one. Perform the Safety Test as described in Step 3, then inject the remainder of the dose to equal your total prescribed dose. In the above example, the remaining dose is 5 units. • Dial back (to the left) to "00". Follow Step 7 (Replacing an empty Cartridge System), Step 1 (Inserting the Cartridge System), Step 2 (Attaching the needle), and Step 3 (Safety Test). • You have dialed (to the right) past the maximum dose of 80 units and have no needle (or a clogged needle) mounted. Dial completely back (to the left) to "00", and perform Step 2 (Attaching the needle) and Step 3 (Safety Test). Do not force the Dosage Knob to turn further. • The Dosage Knob has been forced into the negative range and was pushed in. The Cartridge System might be damaged and needs to be replaced. Repeat Step 7 for replacing an empty Cartridge System and dispose of the damaged Cartridge System. Repeat Step 1 for inserting the Cartridge System, Step 2 for attaching the needle, and Step 3 for Safety Test. • Turn the Dosage Knob slowly backward (to the left) until it stops, and then push the Dosage Knob in. Restart OptiClik ® and dial your dose. Always attach a new needle before use. BD Ultra-Fineâ„¢ needlesâ€ are compatible with SoloStar. These are sold separately and are manufactured by BD. • - use after the expiration date. Keep your SoloStar® in cool storage (36°F â€“ 46°F [2°C â€“ 8°C]) until first use. Do not allow it to freeze. Do not put it next to the freezer compartment of your refrigerator, or next to a freezer pack. • Check the label on your SoloStar ® to make sure you have the correct insulin. The Lantus ® SoloStar ® is grey with a purple injection button. • Take off the pen cap. • Check the appearance of your insulin. Lantus ® is a clear insulin. Do not use this SoloStar ® if the insulin is cloudy, colored or has particles. • Wipe the Rubber Seal with alcohol. • Remove the protective seal from a new needle. • Line up the needle with the pen, and keep it straight as you attach it (screw or push on, depending on the needle type). • Select a dose of 2 units by turning the dosage selector. • Take off the outer needle cap and keep it to remove the used needle after injection. Take off the inner needle cap and discard it. • Hold the pen with the needle pointing upwards. 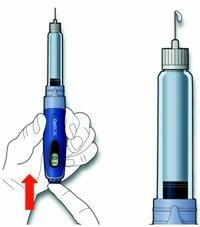 • Tap the insulin reservoir so that any air bubbles rise up towards the needle. • Press the injection button all the way in. Check if insulin comes out of the needle tip. • Check that the dose window shows "0" following the safety test. • Select your required dose (in the example below, the selected dose is 30 units). If you turn past your dose, you can turn back down. 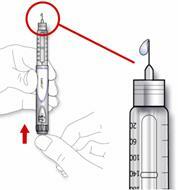 • Use the injection method as instructed by your healthcare professional. • Insert the needle into the skin. • Deliver the dose by pressing the injection button in all the way. The number in the dose window will return to "0" as you inject. • Keep the injection button pressed all the way in. Slowly count to 10 before you withdraw the needle from the skin. This ensures that the full dose will be delivered. • Put the outer needle cap back on the needle, and use it to unscrew the needle from the pen. To reduce the risk of accidental needle injury, never replace the inner needle cap. • Dispose of the needle safely. Used needles should be placed in sharps containers (such as red biohazard containers), hard plastic containers (such as detergent bottles), or metal containers (such as an empty coffee can). Such containers should be sealed and disposed of properly. • Always put the pen cap back on the pen, then store the pen until your next injection.